Could be a terrific headline splashed across the front of international newspapers if all goes well for a US rocket scientist. The NASA researcher has sent ninety of the bright yellow bath toys into the middle of the fastest moving Greenland glacier for an apparently very sophisticated experiment to figure out why glaciers speed up in summer. 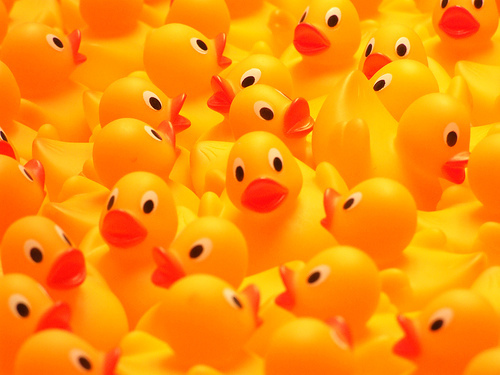 Each rubber duck is labelled with an e-mail address and the words "science experiment" and "reward" in three languages so that if they are found and returned scientists will know where the water ends up. The ducks have been placed in the Jakobshavn Glacier, which is believed to be the source of the iceberg that sank the Titanic in 1912. This glacier discharges about seven per cent of all ice coming from Greenland. As the planet warms this ice sheet will continue to melt contributing to rising sea levels. To date there are only theories about why glaciers speed up in summer as much of the activity is believed to occur on the underside of the glacier where researchers are unable to reach. The ducks will be sent with a probe that contains instruments which will hopefully inform scientists of the inner realms of the glacier.